January 18, 2019, 11:34 a.m.
New data shows that one in four Britons (24%) plan on eating less red meat in the New Year, with women, over 55s and higher social classes most likely to make it a resolution. A quarter (27%) of women intend to cut back, versus 20% of men. Some 28% of those falling into the ABC1 social categories do, versus just 18% of C2DE. And while 24% of people of all ages hope to reduce their meat intake, this increases to 28% among those over 55 years old. So, why the lifestyle change? In line with the fact that half of us also plan on eating more fresh fruit and veg (51% and 47% respectively), the most popular reason for reducing red meat intake is to improve our health. But that’s not the only reason. One in eight (13%) simply don’t like meat very much, 7% want to save money and just over a quarter (27%) want to help the environment. Past YouGov data shows the proportion of Britons who believe we should eat less meat to help the environment is increasing, from 28% in 2015, to 34% in 2018. Among 18 to 24 year olds it now rises to 50%. A widely circulated study released last year in the Science Journal looked at the environmental impact of 40,000 farms in 119 countries which produce 90% of all food consumed in the world. It posited that avoiding meat and dairy products is the single biggest way to reduce your carbon footprint. 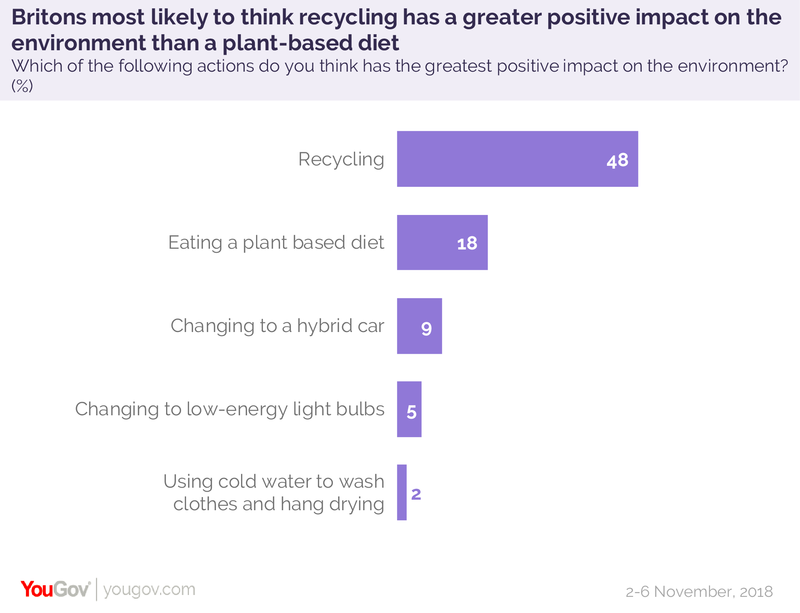 However, YouGov data reveals that only 18% believe that changing to a plant-only diet is the action with the ‘greatest positive impact’ on the environment. This is some way behind recycling (48%), changing to a hybrid car (9%) or using low-energy light bulbs (5%). 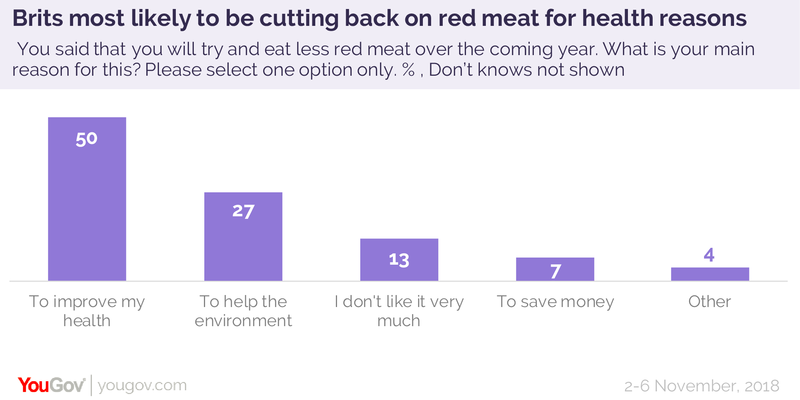 Further, although more and more Britons feel we should eat less red meat for environmental reasons, the public is split three ways on whether they the government should get involved. One third (35%) support government involvement in getting people to eat less meat, 29% neither support nor oppose, and a third (33%) oppose. By contrast, people are considerably more supportive of government intervention to change behaviour around people’s health. 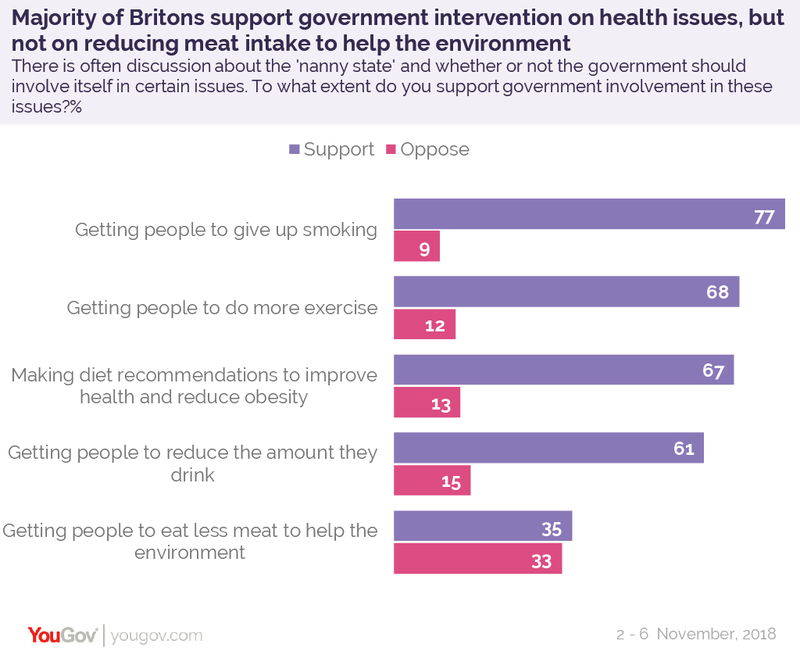 For example, two thirds (67%) support the government making diet recommendations to reduce obesity, with just one in eight (13%) opposing the idea, 68% support government intervention to get people to do more exercise and 77% support it to encourage giving up smoking.